Toddlers and snot seem to be one of life’s great combinations, yet trying to get them to blow their nose on anything but your lounge or the clean top you’ve just put on is apparently impossible. If you’ve balked at the snot-sucking wonder of the Nosefrida and the saline solution isn’t quite cutting it, then get a load of this mum’s hack for unblocking those poor little noses. 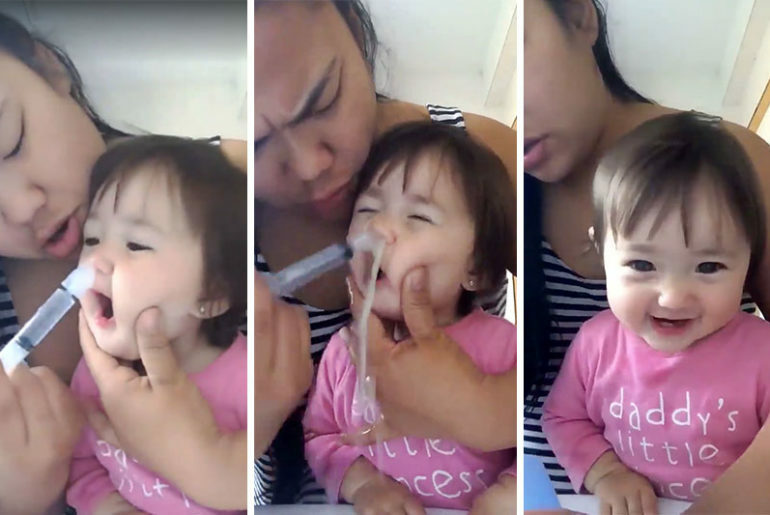 The video, posted to Facebook, shows a mum and her seriously cute daughter. Mum distracts the toddler with the camera, before shooting a syringe full of water (presumably saline) up one of her nostrils. During the clip, you can see the little girl laughing and giggling. But as you can see from the comments, the 21 million viewers are divided as to if this is good parenting or not. Take a look for yourself. And it’s not just parents weighing in. Medical professionals who joined the debate are divided on whether this is safe for your kids or not. When it comes to health care for our kids, it’s obviously always safest to check with the experts. The Western Australia Health Department have advice for nasal irrigation, but if you’re unsure check with your doctor. Meanwhile, we’re just wondering how on earth she got her toddler to sit still for this in the first place! Love a good Mum hack? Check out this great hack for getting babies to take their medicine.